Two weeks ago I climbed a couple of mountains. Which is kind of a new experience for me – a man who lives in Norfolk, one of the flattest parts of the UK. The aforesaid mountains were in Wales; Snowdonia to be precise. We decided that people who live in mountainous regions of the world must be fitter and have better calf muscles than those who live on the flat. 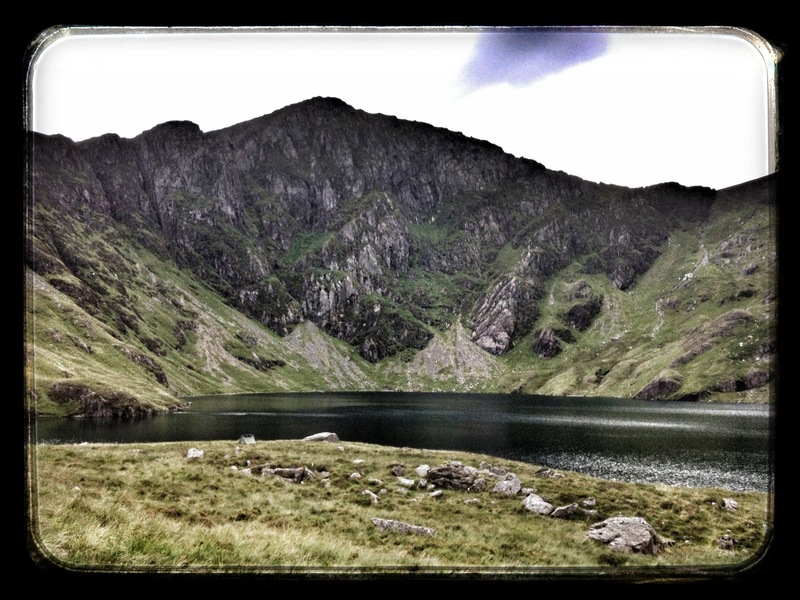 The first mountain is called Cadair Idris (ninth highest mountain in Wales – 893 metres). This is a truly beautiful place, with stunning streams and waterfalls. ’Cadair’ means ’chair’ so this mountain is, according to myth and legend, the ’Chair of Idris’ – Idris being the name of a mysterious Welsh Giant. A mountain that sounds like it is screaming out to have stories written about it. If you are ever lucky enough to go there I recommend two things. One, have bacon sandwich before you start the climb, and two, make sure that you go to the stunning lake, which is more than half way up. This is what we did, instead of climbing to the summit. This lake looks like it is formed from the bowl of an extinct volcano, although geologists say that this isn’t the case. The lake has the clearest still water; water from distant cascading streams falling from the summits filling it incessantly. You can almost feel the slow march of geological time that has shaped the place. You feel small and humbled. The short swim in the lake was an experience. It was incredibly cold (breathtakingly cold) and beyond a short ledge of submerged rock and scree it drops to an incredible 50 metres deep. The feeling of floating above such mysterious clear black depths in icy water was most disconcerting. Needless to say I didn’t swim for long. Obviously if you are going to climb mountains in Snowdonia then you have to climb Snowdon itself, the second highest peak in the UK (1085 metres). It is also one of the most popular tourist mountains as it has a train that can take people to the summit. People tempted by the train are commonly known as ’Train Cheats’ by all those brave enough to climb one of the many routes under their own steam (as it were). Personally I couldn’t understand those who spent considerable sums to take the train on the day we climbed Snowdon. The summit was covered in cloud (as it often is) and taking the train just means you pay a lot of money to stand in a cloud and not see any of the stunning views. 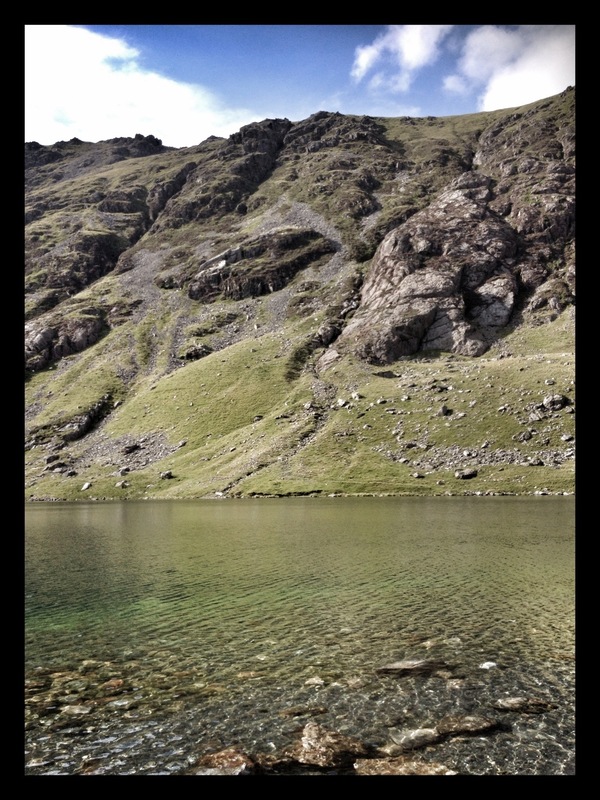 My five tips for climbing Snowdon – one, eat properly! Two bits of toast for breakfast isn’t enough! (Can you tell I am not a seasoned climber?). Two, choose a sensible route for your fitness level (we walked the ’Rangers Route’, which I would describe as a medium route and is still a bit tricky in places, especially if your knees, like mine, are not so hot). Three, wear some layers; once you reach a certain height, even in summer, the winds can be pretty chilly. Four, if you find it hard going comfort yourself with the promise of the best hot chocolate in the world at the summit cafe. Five, don’t be a ’Train Cheat’ – challenge yourself! So, what did I learn from my novice climbing experiences? As a writer any travel to new places can give you backdrops for stories that you never previously perhaps imagined. I can see Idris the giant in my mind’s eye, straddling his gargantuan chair. And the climbing itself? 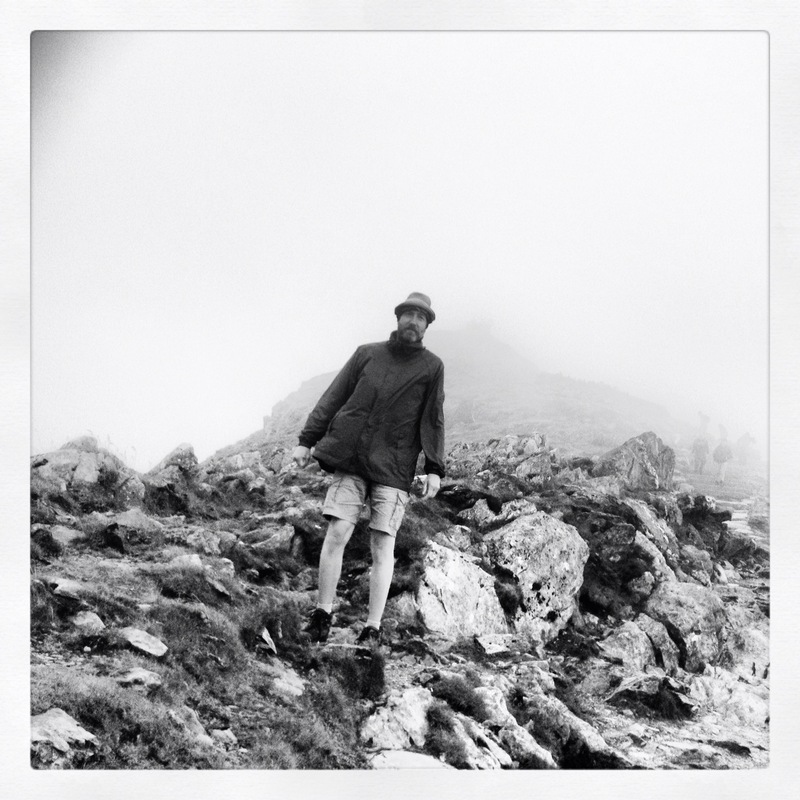 Well, climbing a Mountain is actually a bit like writing a novel. 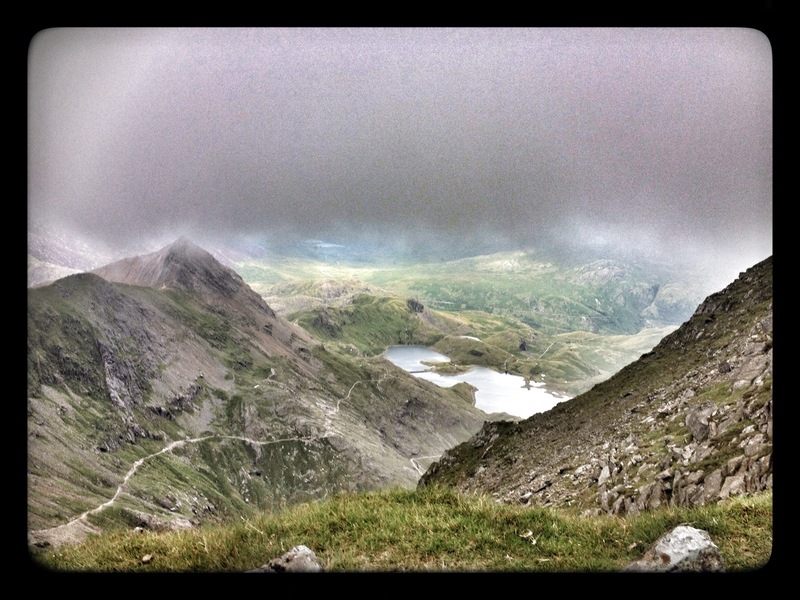 The last hour of climbing Snowdon (which took 2 hours 35 minutes – not bad going for an old fart with dodgy knees) was really tough. It’s that thing where you continually think you are nearly there only to find around the next bend or over the next lip of rock there is yet another steep climb looming ahead of you. It can feel like the summit is forever beyond your reach. Writing a novel can feel like this, with the ending so far out of sight, locked away in the clouds. When you hit this wall the only choice you have is to dig in and keep going. On a mountain you pretty much have no choice, once you have reached a certain point going back down would probably be as hard as keeping going. In other words you can’t actually give up (short of being helicoptered off the mountain by Prince William of all people!). So you simply keep going to the top, however hard it seems. < Previous Paperbacks or Ebooks? Great photographs. Thanks for the inspiration!